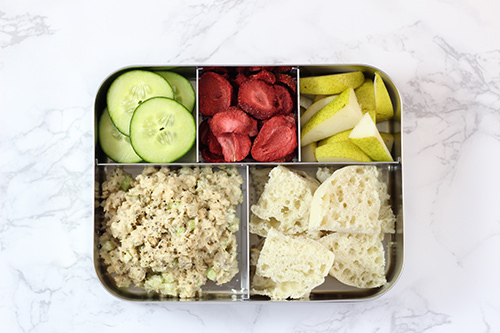 Do you want to pack your kids healthy school lunches? Look no further! 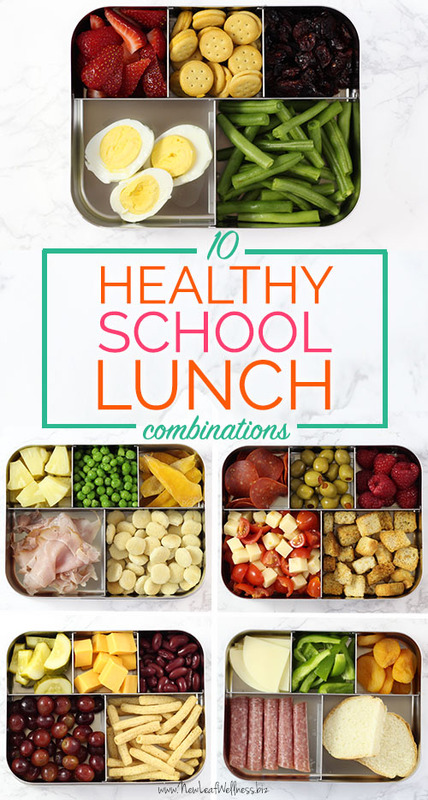 Here are 10 combinations that are healthy, delicious, and fun! My kids are not picky eaters, but they are definitely pickers! 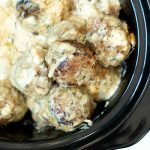 This summer, I have gotten into the habit of pulling out our muffin tins and filling each spot with something different. The boys love to take their trays out to the patio and have picnic lunches. As our oldest prepares for 1st grade, I knew that I wanted to pack his lunches the same way. After all, variety is the spice of life! 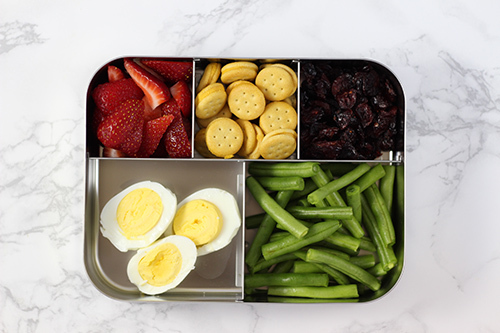 There are several bento-style containers that work well for packing foods to pick from. 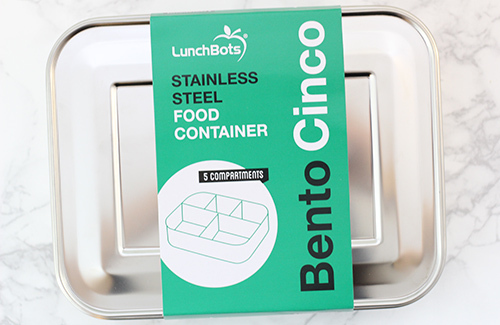 However, after researching like crazy, I decided to try out LunchBots Stainless Steel Cinco Bento. 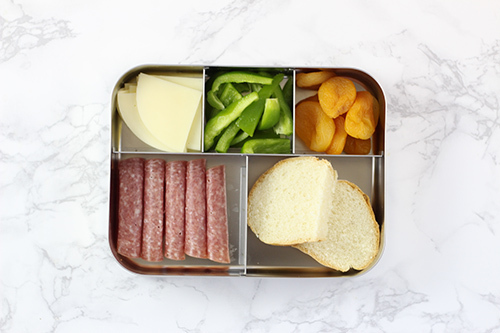 Why do I love the LunchBots Bento Cinco container? It has five compartments! LunchBots does make single, double, triple, etc. containers, but, as mentioned we like options!! 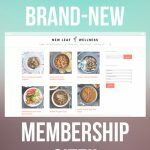 When creating this list of options, I tried to include a protein, a vegetable, a fruit, a carbohydrate and a treat in each box. It’s stainless. Trust me, we own our fair share of plastic, but we are really trying to minimize using it with our food as much as possible. 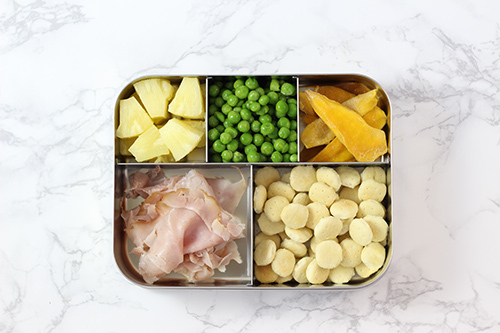 If you choose a plastic bento, please choose BPA-free. Who doesn’t love pizza?! 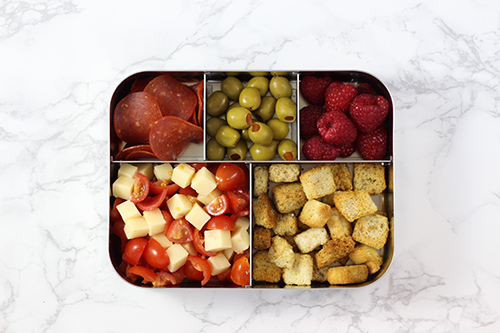 This fun bento includes pepperoni, tomatoes & mozzarella, but instead of crust we opted for crunchy croutons! My five year old LOVES olives, so a big ole pile of them truly is a treat. 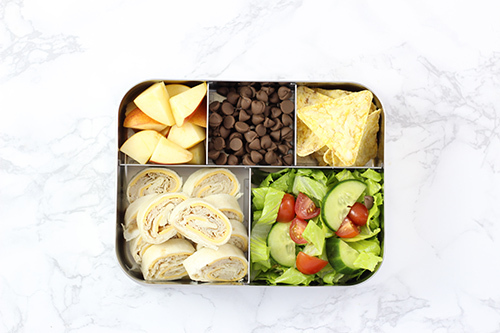 Turkey, cheese, apples, popcorn, chocolate chips…need I say more?! My husband is a ham and pineapple guy. 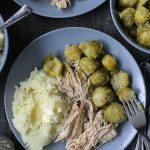 What vegetable goes better with ham than peas?! 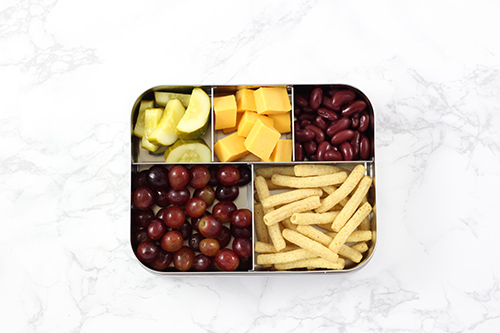 Oyster crackers and dried mango are two of our favorite things to munch so they round this lunch off perfectly. 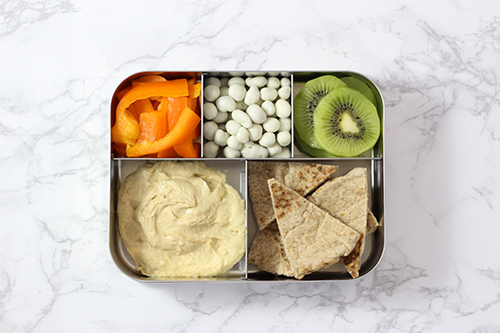 My kids LOVE dipping vegetables in hummus (and ranch dressing), so when I make this next time I’m going to use LunchBots three tiny containers for hummus, ranch dressing, and yogurt raisins and then fill the Bento with all kinds of delicious vegetables for dipping…peppers, carrots, cucumbers…yum! My kids love hard boiled eggs. They are fun to eat and full of nutrients! If your child is adventurous you can pack their favorite hot sauce for dipping! My father-in-law lives in Alaska, so the boys are already huge fans of salmon. When Pop Pop’s salmon isn’t available, I stock up on these Wild Salmon Pouches. The boys will eat it right out of the pouch, but it makes good salmon salad too. Plus it’s super fun to stack on top of an english muffin and top it off with a cucumber. Ever since my kids were babies they’ve been polishing off avocados left and right! So why not throw in some black beans for protein and tortilla chips for dipping action. You can even pack a side of salsa if you’d like. 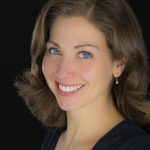 When we’re not crock-potting (Gasp! Yes, we actually eat something else every now and then), my husband likes to grill chicken breasts with a little olive oil and our favorite spice blend. 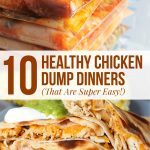 We usually throw it over a big salad, but the boys like to pick it up and eat it like a chicken tender too. We’re also notorious for making too much pasta salad (coleslaw, potato salad, fill-in-the-blank). Thankfully, it’s a perfect thing to pack for lunch the next day. When I was a kid I would sit on my Grandparent’s porch and eat salami and provolone sandwiches made on the freshest Italian bread imaginable. I also used to “steal” dried apricots out of a big glass jar on their counter. We can leave the part out about the Faygo soda…or Pop as they say here in Pittsburgh! Yep, making this bento makes me what to run to my Grandma’s house and sit on her porch (she’ll be 91 this month!). 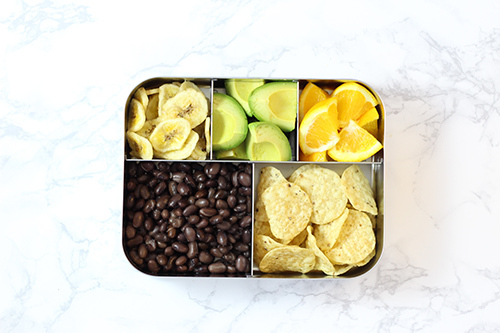 Last but not least, here are some fun ideas for LunchBots’ adorable leak-proof containers. One of the things that my kids LOVE to snack on is nuts. Sadly, many schools do not allow nut products in school lunches due to rising nut allergies, so I left them out of the lunch ideas above. 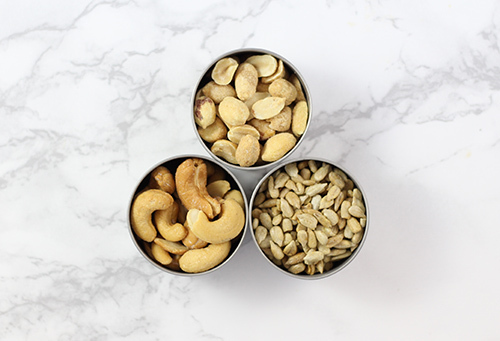 IF nuts are allowed in your child’s school, these sweet little containers are the perfect carrier. If not, no worries…there are a ton of other fun ways to use them. I hope you have as much fun making bentos as I do! The possibilities are truly endless, so please share your ideas with me in a comment below! Great ideas! I love them! But over $40 for the container to hold them? I’ll figure out some other way to package them! Thanks! 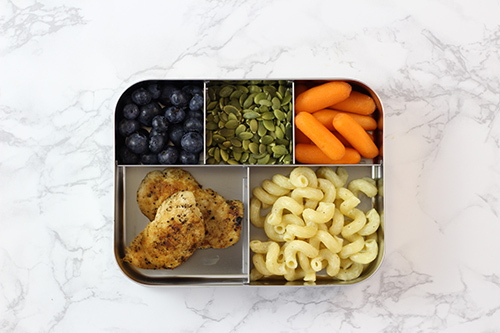 There are a lot of multi-compartment lunch boxes out there. I’m certain that you will find one that suits your budget. I just use silicon cupcake liners to make compartments. My girls love the bright colors. Kristy, Oh I love that! Thanks for the tip. If you’re not opposed to plastic, maybe one of these would work? Great ideas! For folks who want a less expensive bento, get one of the 3-divider ones, and use silicon baking cps to make 2 dividers in the larger one. Works for us.